UK: Let's Stop Murdoch's BBC Robbery Now! The BBC is being forced to hand over tens of millions of pounds every year to line Rupert Murdoch’s pockets. Murdoch’s cronies in government are determined to save this scheme -- but together we can stop this outrage. These unbelievable regulations cost our public broadcasters up to £100 million a year. Rather than being paid for their valuable content, they actually have to pay BSkyB to show their programmes. This extortion is unprecedented in any other Western country -- and a sign of Murdoch’s shocking power. In coming days, Culture Secretary Jeremy Hunt will decide whether to renew this dreadful deal -- and Murdoch's scandals have put him on the back foot. Our pressure can stop this BBC robbery. These are our millions -- handed over in license fees to fund British content, not to boost Murdoch’s profits. But an unfair system of “retransmission fees” designed by Murdoch leaves the BBC and other broadcasters with no choice. They are forced to pay BSkyB to show their channels, even though they add huge value to the satellite platform -- accounting for 41% of all shows watched on BSkyB and vastly increasing customer retention. Amazingly, Murdoch has argued the exact opposite in the US -- there, he charges cable TV companies over $250 million a year to show his content. With the same deal Murdoch gets in the US, our public service broadcasters would have hundreds of millions of pounds extra every year to invest in quality content. This money would allow the BBC to reverse its cuts to BBC4 and local radio overnight. Murdoch's cozy relationship with our politicians has won him this outrageous UK scheme -- but his power is starting to crumble, and together we can end it. Labour has already come out against this deal, and Culture Secretary Hunt is about to make his decision in his communications review. Avaaz members in the UK and around the world are leading the charge against the Murdoch mafia. Last year, we helped kill his proposed takeover of BSkyB and won press inquiries he didn’t want. Now, we can stop this BBC robbery. 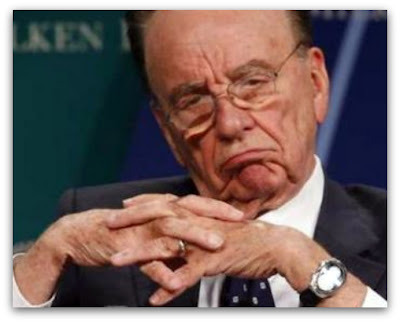 By continuing to challenge his corrupting influence where ever it appears, we can reign in Murdoch’s empire for good.